Designed specifically to fit the HK91 / PTR91 / HK G3 / JLD (.308 / 7.62 X 51). Our Latest Version. This mount differs from our Regular 14" Long HK Low Scope Mount ONLY in that it has 4 WINDOWS / SLOTS cut in the top in order to see the Serial Numbers on HK 91s / HK G3, Century 91s / C91 and Vector 91s. Some of the aforementioned have serial numbers stamped on the top of the receivers. Cutting these slots was a direct request from our Law Enforcement Clients who have to see the serial numbers in order to check them in and out or the weapons lock up area. In most cases the entire serial number is 100% visible. In a few occurrences like it all depends on where they stamped the number. The MFI Low Profile Slotted Scope Mount is the ONLY low profile mount on the market that does not require the mount to be removed in order to see the serial number. This model fits only the .308 / 7.62 X 51 Caliber Full Size Heckler & Koch G3 / HK91 / Century C-91 and Vector V91 variants. It will also fit the shorter V51 / HK51 without any modification. We currently pushing these into the supply chains for all Theaters of Combat Operations including: Iraq and Afghanistan not to forget Law Enforcement / SWAT Teams and Private Military Contracts like BLACKWATER / "Z" throughout the world. So if your Supply Officer does not have any we can sell them directly to you. MFI has a long history of being a Licensed BATF 07 Manufacture with a SOT / Class II & III. This item will fit UNIFORMLY all HK-91 / HK G3 Full Size Variants. The above photos shows the MFI PROTOTYPE of the 14 inch long HK Low Profile Scope Mount . This shows you that we are the manufacturer and gives a little insight to the Research & Development that goes in to any product. SPECIAL MODIFICATION NOTE: If you are using this item in-conjunction with HK Wide Body / Fish Belly Hand Guard you will need to make a minor modification to the hand guard in the rear section where the 3rd set of legs / hooks are. This modification can be made easily with a hand file or Dremel Tool. All you are doing is removing the top section of the shelf of the hand guard (see photos). You are filing off / cutting or grinding out about 1.25" long of the rear hand guard lip. You will need to have a slight angle that tapers to the rear to allow the hand guard to slip past the 3rd set of legs / hooks on the mount. Photos below show the same modification required on the HK33 / HK93 hand guard. We use the same photos for both .223 and .308 rifles as the modification to the hand guard is in the eacxt same location. No Modification is required is you are using the Slimline / Slim Line style hand guards or any hand guard that does not hit the receiver in this area. Made Specifically for LIVE WEAPONS. In other words this is NOT some toy or piece of airsoft CRAP made of questionable pot metal in foreign factories by people who have never even seen a real machinegun. Others less reputable dealers are known to try to sell items that were intended for airsoft bb guns and hope you do not notice until it is too late... meaning when you are dead due to a failure of their untested / junk product. The above photos shows the MFI PROTOTYPE of the 14 inch long HK Low Profile Scope Mount on a PTR-91 with US Optics Sniper Scope and PVS-22 Night Vision Scope. This is to clearly demonstrate that there is plenty of room to mount a full size sniper scope in tandem with most night vision scopes. The night vision in this case is a Military PSV-22. MFI is the GENUINE ARTICLE / REAL DEAL that others copy. This is one of the lowest profile mount available on the market. 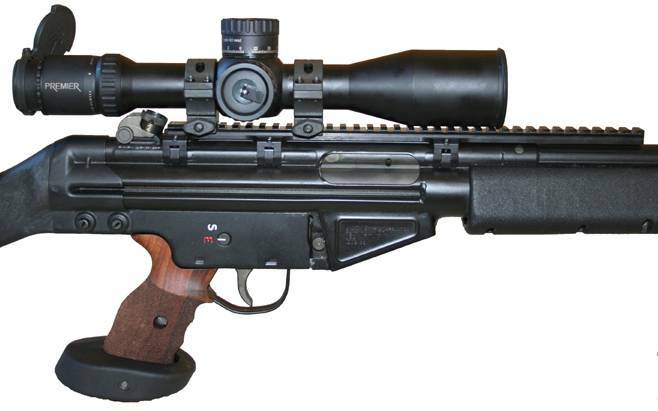 Designed for MP5 series guns only to mount either Red Dots / Aim Points or Conventional Scopes. By far the Most Cost Effective WITHOUT Sacrificing Quality HK Scope Mount on the market. Note that the attachment mechanism is NOT a quick release style like found on the original HK mounts. We thought about using some sort of quick release but, as we have heard that the Original HK Mount in a tactical situation has been known to un-lock if you accidentally hit that paddle lever. It does take a little more time to mount these (2-3 minutes) but, once they are in place they will never accidentally un-lock. Additionally we made these with the LOWEST PROFILE possible so that they do NOT interfere with the open / iron sites when a scope is not in place. The profile is so low that there is no reason to remove the mount once it has been attached to the weapon system as it does not interfere with any normal function or cleaning. Lastly: 100% Picatinny / Mil. Spec. 1913 Correct. Meaning that your expensive LaRue or SWAN Throw Lever / Quick Release / ARMS Scope Rail Mount will lock 100% the way it was intended. We have seen the influx of hundreds foreign made mounts, rings, risers, rails etc. that claim to be Throw Lever compatible but, are NOT. This one is 100% COMPATIBLE! We also sell a variety of Scope Rings to accommodate most any Scope on the market. Be sure to check these out as we supply photos of several H&K weapons with this mount and rings attached. Diagrams with complete measurements are there to guide you to the right set up. Weapons Grade Hardened Steel Legs / Hooks. Mil. Spec. Black Oxide Coating. 14.0 Inches ( 355.6mm ) Long. Low Profile Rail Height @ 0.420" ( 10.70mm ). 100% Picatinny / Mil. Spec. 1913 Correct. 6 - Independent Draw Style Hooks for 100% Secure Attachment. 0.255 Inches (5.5mm) of Draw Length to accommodate even CETME / Out of Spec. Weapons. Chamfered Edges for Fast / Easy On & Off in Adverse Conditions. 3 - Counter Recoil Slots to Mate with your Specific Weapon's Scope Mount Anti-Recoil Blocks. 4 - Added Stabilizing Points at the Far End. This keeps a solid contact between the top of your receiver and the scope mount. Does NOT Interfere with the iron sights when a scope is not in place. Clear unobstructed view over the rail. We try to keep the rail as low a profile as possible in order to meet Military requirements of being able to use the iron sights when the optic is removed. 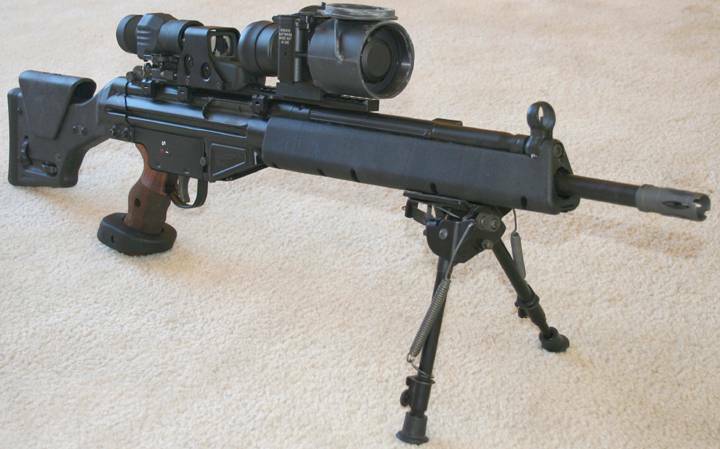 The rail height is as high as it can be WITHOUT completely obstruction the view / use of the iron sights. It is inherent of a design like this that the attachment points i.e. the legs that roll over the side of the receiver may conflict with the specific optics mounting solution. Up until this time (01-2013) we have never had an issue with any mounting solution. The following is a list of mounts to avoid. (currently only one known manufacturer, but I will add to it if others make the same mistake). Again this is an issue ONLY with this specific mount and it's placement directly over one of the legs. It does fit on the rest of the rail without any problem, so it is a matter of personal eye relief. New 2013 EOTech EXPS3 & G33 Magnifier's Throw levers are too wide and hit the top of the MFI leg. This is NOT an issue if using the older models or the SWAN throw lever version. Unlike our competitors (B&T / Brugger + Thomet / EOTech and others) our mount takes less than 3 minutes to mount on the weapon. Additionally we have ONE MOUNT THAT FITS ALL of the following Real World G3 / MP5 Heckler & Koch Weapons Systems. 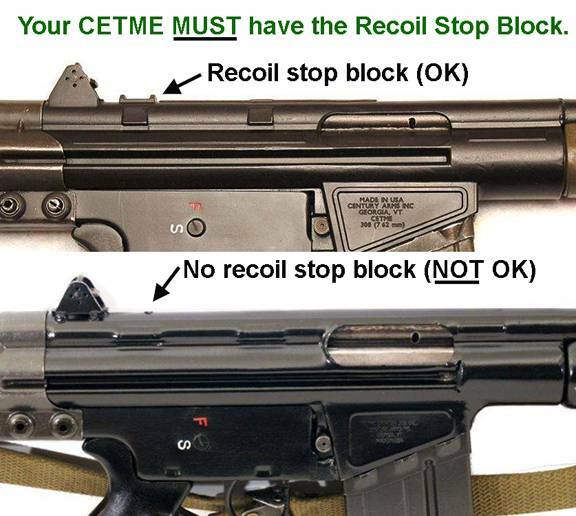 NOTE ON CETME & CLONES: See the photo section above for a photo depiction of the require part. 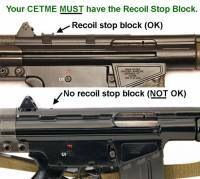 Basically CETME made a number of money saving cut backs on their weapons. Rear sights are never as nice as HK’s and most do not have the recoil stop block and are considered open sight guns only. If there is no Recoil Stop Block then there is nothing keeping the mount (ours or anyone else’s) from walking down the receiver. NOTE: G3s with HK Ejection Port Buffers, Carry Handles or any device that rolls over the top of the receiver in the same location as where the mount fits can NOT be used in tandem with our mount. The MFI Low Profile mount lays flat on top of the receiver with near ZERO clearance. Be sure the weapon is unloaded and the safety is on. Remove all 6 of the small bolts from the mount. Open / pull outward the bottom of the hook / lock point on all 6 points. Place the mount on top of the weapon's scope mounting points be sure that the mount sits flat and level on the top of the receiver. Press down gently on the mount. While pressure is applied press ONLY the 4 rear most mounting points back inward toward the receiver. NOTE: At this time do NOT place bolts into the 2 most forward hooks / legs. Place the small bolts back into the 4 rear most holes and down into the mounting points and tighten by hand to avoid cross threading. Alternate from bolt to bolt as you tighten to keep the mount level. Use a 5/64 allen key / hex wrench to finish tightening (do not over tighten). The mount is now installed. To remove simply reverse the aforementioned instructions. Now place the small bolts into the 2 holes at the front end of the mount, but do NOT tighten them down yet. The reason why you do not screw these down with the other 4 in the rear is that the gusseted mounting points in this area of the receiver do NOT have the final milling pass done to create the right angle shelf as in the rear 4 points. Therefore the hooks / legs will be grabbing the receiver slightly lower than in the rear and in a different position. BEFORE you tighten these 2 bolts down, screw down the 2 set screws in the front of the mount just enough to apply pressure to the rail to keep it level from front to back. The top of the receiver is also different from the rear in height in this area, so the stability and strength is achieved though a balance of pressure between the hooks pulling downward and the set screws applying pressure upward. Now you may tighten down the 2 bolts for the legs. Some adjustment back and forth will be needed to set the tightness and to level the top of the rail. Always tighten by hand first to avoid cross threading. Alternate from bolt to bolt as you tighten to keep the mount level && centered. 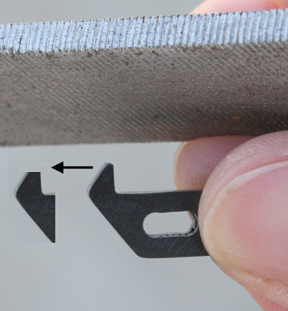 Use a 5/64 allen key / hex wrench to finish tightening (do not over tighten). The mount is now installed. NOTE: There is NO exact setting for the amount of torque for the bolts. You should be using a (New not worn out) standard small "L" shaped (single) allen key for this operation. The key will noticeably bend / flex when you have reached the correct torque. Over tightening will only result in the heads of the bolts to be stripped. To remove simply reverse the aforementioned instructions. Never use Loctite or any other thread locking compound as it will take a torch to get the mount off or you will strip the bolt heads. Once attached to the weapon this mount should NOT be removed. It does NOT interfere with the iron sites or any other operation such as cleaning. On and Off removal will result in stripping the threads on the hooks. We do NOT accept exchanges on modified mounts or on counterfeit / copies of our product. Because there are so many G3 / MP5 variants (genuine and clone) out there & in 6 different calibers, that span 30+ years of manufacturing changes, some hand fitting may be required. The issue mainly stems from the fact that in order to get a good solid fit we have to hold very tight tolerances. The tolerances that the manufacturers hold to are far less stringent. This mount unlike other HK style mounts does NOT squeeze the receiver via a cam mechanism or utilize a side to side lock. We are clamping to the small gusseted shelves in an up and down fashion. This "sandwiching" type of mounting system is far more robust and stable than any side to side type of mount. Again we are dealing with a tolerance of +/- thousands of an inch (less than the thickness of a couple playing cards). Some hold tolerances only to +/- hundredths of an inch as there is no solid Mil. Spec. for this area. Using thicker or thinner steel for the stamping. The application of too much paint. Dripping paint over the ledge of the shelf. Use of old or worn tooling. Not making the final milling pass to flatten the shelf / ledge. MFI has a solution for all of the above out of spec situations. First and foremost your MFI Low Profile Scope Mount is 100% covered for life from any manufacturing defects. PROBLEM: My MFI mount SLIPS OFF when tightened or does NOT grab the shelf or shelves as it appears the legs / hooks are NOT long (width) enough to make solid contact with the receiver ledge. There is a glob of paint / paint drip that is covering the sharp right angle of the lower part of the ledge where the hook / leg hits the receiver. Look to see if this might be the issue. If you cannot see a clear delineation in the shelf that makes a sharp right angle for the ledge then take a probe / hand file / sharp pointed object and run it across the ledge to remove the excess paint. NOTE: Each steel leg / hook costs us $7.00 to make. So we supply these on a per needed basis only. You may be required to send in the old legs for length verification. Otherwise a set of (2) legs / hooks are available to buy for $15.00 (which includes S&H). PROBLEM: My MFI mount does NOT sit flat / level on the top of the receiver. NOTE: There should be a uniform gap / space between the bottom of the mount and the top of the receiver. ANSWER: You likely have not fully seated the mount over the anti-recoil stop block (the part sticking up just forward of the rear sight on a G3 (HK 91 / HK 93) or the welded taps in the center of the receiver on a HK MP5). With the mount just sitting on the top of the receiver (no screws or bolts in the hooks / legs) it should sit flat and level. If NOT... Although quite rare... You likely have a CETME, HK Clone or Mid 1980s HK91 build using after market rear sight blocks that have the tower portion (part sticking up) that is too tall. Generally the fastest fix is to file down the tower with a hand file. We are talking about only a few hits with a hand file to knock the high spot down. The other option is to mill out the MFI rail from underneath where we already have the cut out slot. PROBLEM: I cannot get all of the bolts / screws in the hooks / legs of my MFI HK Low Profile Mount. Meaning... When I look down from the top of the mount, through the hole where the bolt goes in the main body of the mount, I see that the hook / leg is sitting at a slight angle pointing inward towards the center of the receiver. DO NOT force the bolt in as you may cross thread or strip the threaded holes in the legs. First be sure that the mount is centered on the top of the receiver. It is normal to have some side to side play to center the mount. If it is centered then continue to step "b". If NOT then you will need to do step "b" to all legs / hooks in order to have the mount centered on the receiver (this is very rare). b. Use a hand file or Dremel fiber cutting wheel (use the side of the wheel) & remove a small amount of the material on the leading edge of the leg / hook where the leg / hook hits the receiver ledge / shelf. You need to remove the same amount from ALL of the legs on the 5.5" and 6.5" long mounts. Mounts that have 6 legs you will remove the Same amount of material on ONLY the 4 REAR legs. So try to remove the same amount of material from each leg. Do NOT remove material from the set of legs forward of the ejection port as this area does not have the shelf / mounting point built into the receiver like the rear does. This will take some time and require you to mount and dis-mount the MFI HK Low Profile Mount from the receiver several times. In doing so you will end up with a Rock Solid mounting platform custom fit to your weapon. NOTE: As a secondary precaution / peace of mind... You can be assured that our scope mount is NOT defective by simply taking it off the weapon completely and screwing in all the bolts. If they all line up and screw down then it is obvious that holes are NOT misaligned. You should always use this type of logic and process of elimination when trouble shooting any issue.